It didn’t matter how many times NPR told me to NOT stare at the eclipse sans special glasses this past Monday. My natural instinct was to look up. Luckily for me, I was able to combat the urge. Based on Google Trends data though, it appears as though many Americans couldn’t resist. Just take a look at when searches for “my eyes hurt” spiked. And if you were wondering, Flori-duh (where we’re proudly headquartered) wasn’t the worst culprit. In fact, we were far from the worst. By looking at the map on Google Trends, the states that were in the general path of totality seemed to have the most searches. Makes sense considering there were a lot more people excited about the eclipse in those states. 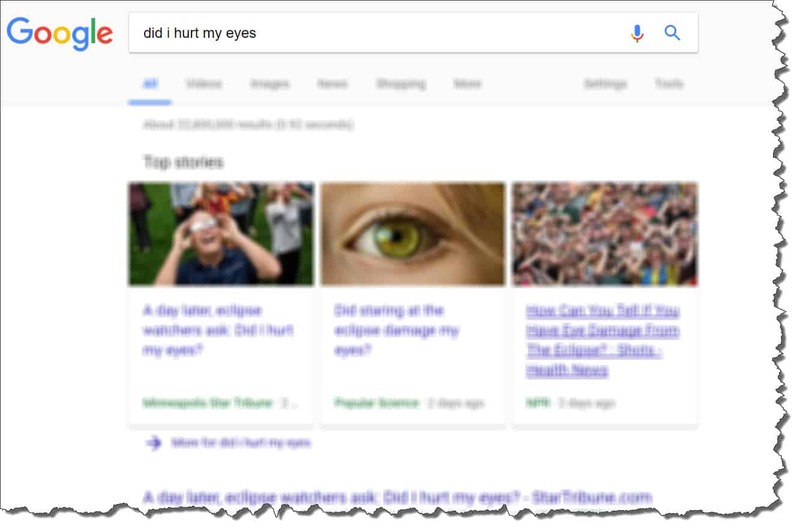 I kind of wish Google would’ve gotten sassy after the search “did I hurt my eyes” and show blurry search results. Then we all would have been really confused. Imagine you had the foresight to know that “my eyes hurt” was going to be a popular search shortly after the eclipse. Imagine if you created a piece of content on your website that incorporated the phrase “my eyes hurt” (or a related query). For a marketing agency like us, you might have a piece of content titled My Eyes Hurt When I See a Website on Wix (seriously, if you have a Wix site, call us right now and ask to speak to the bearded guy in the hoodie). For LaVar Ball’s Big Baller brand, you could have a piece of content called My Eyes Hurt From Staring At So Many Lonzo Ball Highlights. It would be a fitting article alongside My Wallet Hurts After Spending My Entire Paycheck on Big Baller Shoes. If you do it right and get lucky, you might attract a ton of new organic traffic when people are searching those phrases. Since 2011, Google has gotten a lot smarter with relevant search results, as well as incorporated smart search results– results that don’t require you to click into a site. There are plenty of SEO tactics you should be doing before you focus on newsjacking. That being said, if your business has a great SEO team that’s doing all the right things, it doesn’t hurt to experiment with a little newsjacking every now and then (when it makes sense). Need help with SEO? Chat with one of our SEO specialists by dialing 866-999-4736 or heading to our contact page.